There has never been a time when fashion designers are as preoccupied with the ‘street’ as they are now. At this stage it has become a mystical entity—although, even Tommy Hilfiger has jumped on the bandwagon. This proliferation of clothes designed specifically for the street emerged three years ago when brands like Vetements and Gosha Rubchinskiy were on the rise. 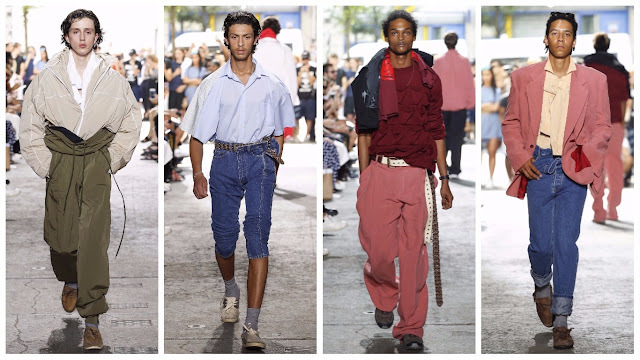 Now, there is also Martine Rose (who consults for Balenciaga, which also prioritises the street) and the subject of this critique, Glenn Martens’ Y/Project. Y/Project like the others mentioned is a proprietor of subverting streetwear, either with subtle sophistication or by honing in on the peculiarities of the day-to-day wardrobe. ‘The street’ is a vague term, and it is interpreted by many designers in their own way. The new wave of fashion design is characterised by the perversion of mundanity, abstraction of normality. ‘Extreme normality’ I’ve dubbed it in the past. To the naked eye, extreme normality is recognisably perverse: it celebrates a twisted vision of what is considered ‘beautiful’. Martens’ collections have been underscored by this affinity for manipulating mundanity. 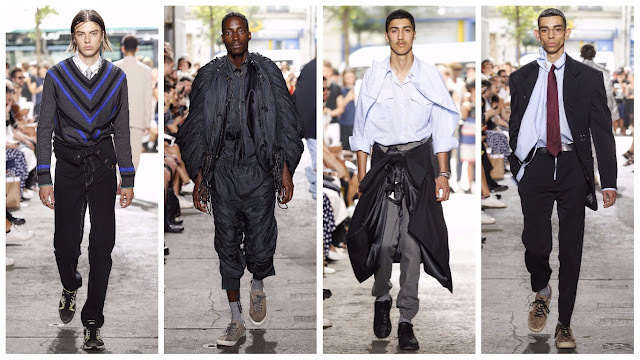 The men—and few women—in this menswear show emerged from the sidewalk and into the show space where they stormed the runway in garments tinged by the 1980s and 1990s. (Interestingly, much of the label’s output is unisex.) The beginning of the show worked on texture play. Cotton shirts and three-quarter length denims, silk shirting with rain jackets, an anorak with extra sleeves for stylistic effect and black jeans. Oftentimes, the incongruity of the styling worked, in parts it didn’t; one felt there was an overload of options, which expressed indecision rather than stylishness. Styling tricks are often relied on by brands and it is the case at Y/Project, but unnecessarily so. The clothes here are impressive, brilliantly odd at times. The splicing of two garments, for example, was fascinating and conjured images of country club members and the way they tie their sweatshirts. His approach to workwear was inappropriate but it had character. Martin Margiela, Vivienne Westwood, amongst others, and their incredible legacies have long inspired the new set of creatives. Their work was bold and unabashed in its expression and it lends itself to contemporary design, for it encourages unapologetic self-expression. Y/Project may broach pastiche territory from time to time, but compared to the blatant consumerism and cynicism of a brand such as Vetements, one wonders why it hasn’t been as prolific. With the decampment of Vetements operations to Switzerland, their anti-show stance, perhaps now is the time for Y/Project to receive the attention it deserves.